I love summers, I really do. As the stay-at-home wife of a teacher, summers are a great opportunity for us to spend a lot of time together as a family. We travel, which we can’t do much together during the school year. We visit parks and museums and try to get outside when it’s not a trillion degrees. We swim and play. But each year I also realize how difficult it is for my toddlers to adjust to our no-schedule summers. And every summer I find myself struggling with disciplining our strong-willed girl (now nearly 4), yelling in anger, wishing for an hour to lay down and read a book. As Libbie’s brother, David, is learning to talk now at 19 months, we’re entering new territory with him as well. My husband and I are very laid-back, which makes it feel like we’re in constant conflict with our schedule-craving wee ones. I don’t want to plan each day during July. I don’t want to explain to my child yet again why daddy is home and not at work. I don’t want to answer questions about when Christmas is coming again when it’s 103 outside. But I find, as always, that our quality of life almost always comes around to my attitude and my behaviors more than it does my childrens’. If I stay calm and in control, they will settle down. If I’m willing to make a plan, they are 900% more content. If I write out ideas for three meals a day and shop for the groceries, meal and snacktimes are less harried and happier – and produce much more pleasant kids. Perhaps you’re nearing the end of your summer … or maybe you are out of school ’til Labor Day. Do you find parenting harder in the summer? Or is it all bliss on your end? Q: My 4-year-old stutters. What should I do? Show support. 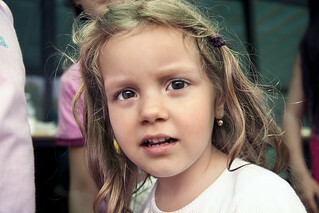 Your facial expressions and body language are as important as what you say to your child. Be patient with him. Slow down. Be a good role model by talking more slowly and enunciating your words. Ask only one question. Allow your child to think about and respond to one question at a time. Answering multiple questions all at once can jumble his thoughts and speech. At a young age, your child cannot distinguish between reality and fantasy. To him everything is real and true. As he gets older, he begins to understand more about real versus pretend. Gather a stack of books and videos. Help your child create two stacks–those that tell pretend stories and those that tell things that really happened. Include a Bible. Stress that stories in the Bible are true and really happened. How can you tell the difference between an imaginary story and a true story? What’s your favorite movie? Is it true? (Even if a story is based on a true incident, talk about how movie writers change things to make a better story.) Where do movie writers get their ideas? What is your favorite Bible story? Is it true? What is the difference between a good story from a book and an event in the Bible? Is it possible to know for certain that God’s Word is true? How? Repeating short phrases from Scripture will acclimate your child to Bible memorization and implant the truth in her heart! Here are some simple ones for preschoolers. Scott Wiley is a curriculum editor, kindergarten Sunday School teacher, and student of many subjects. He blogs at Brick by Brick. 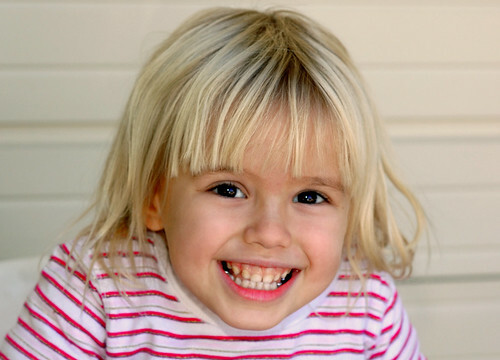 How can you be sure that a preschool you’re considering is the best fit for your child? No longer just a place to play, preschool is now an important part of a child’s education, building a foundation for developing skills that lead to later school success. Does the preschool program provide curriculum-based education and enrichment activities? Developmentally-appropriate academic programs prepare children to be lifelong learners. How does the facility help to prepare your child to meet state standards? Evaluate the arts program – are the projects child-driven? Are students given materials with freedom to be creative in constructing the end result, thus expressing themselves through art? Review the physical fitness plan. Does the center provide activities that focus on health and fitness? How is technology integrated into the lessons? Today’s best preschools offer multiple ways to utilize computers and technology to enhance learning experiences. Does the center offer your child a variety of ways to interact with other children throughout the day? By exposing your child to a range of participation formats—independent, small group and large group—your child becomes a more well-rounded individual, better prepared for kindergarten and beyond. If you’re choosing between several options, take note of how each preschool handles each of these crucial topics. Once you’ve gathered all the data, you’ll have what you need to make an informed decision that’s right for your family. ParentLife also suggests you take into account whether you want to send your child to a faith-based preschool or not. Talk to other parents, do some research, and see if your church has a preschool. We also acknowledge that sometimes just being at home with mom and dad and siblings is the best choice for your preschool-aged child! Do you send your kids to preschool? If so, how did you decide on one? My (Jessie’s) kids go to a two-day Mother’s Day Out program right now. This has been great to give me some time to do freelance work, clean, run errands, or just breathe! But I can see putting my daughter (3.5) in a preschool at least 3 days a week. She will be almost 6 before she starts kindergarten. For those of you who have had a child before, I can imagine you can relate to the time spent waiting for the arrival of your new baby. Many people told me this would be the hardest part of pregnancy – those last few weeks when your comfort level is decreasing, sleep doesn’t come as easily, and the inevitable question of “when” weighs heavily on your mind. So what do you do to keep your mind occupied and at ease? My husband and I as we prepare to become first-time parents. There is so much to learn, but we know God has entrusted this precious gift to us, and we are grateful for this blessing. A safe and healthy delivery. With this being my first child, I don’t know what to expect other than what I’ve read, heard from friends, and learned in childbirth class. I also spend time praying for our daughter’s future. I pray she will develop a vibrant relationship with the Lord as she grows. I pray she will follow the Lord’s direction for her life. I pray she will see her parents as a true model of Christ before her. I even pray for her future spouse, that he will be growing and maturing in Christ over the many years he has ahead, as well. What an exciting stage we are at in our lives! While I pray things will progress quickly, I know God’s timing is perfect regardless of my impatience! Becky Suggs and her husband, Robert, live in the mountains of Glorieta, New Mexico, with their pug, Sadie, and new daughter Anderson, born in April. In her spare time, you can find Becky reading, enjoying the great outdoors, filling in squares to the latest crossword puzzle, and spending time with family. She has a passion for both kids and camping ministries. This is an extra bit that expands on the article “Easter & Your Preschooler” in the April 2012 issue. tomb — Jesus’ body was put in a tomb. A tomb was a place to bury people, usually a cave with a big stone door. alive — God made Jesus alive again to show how much He loves people. God can do things no one else can do. You may also want to tell your child that even though she cannot see Jesus, she can know He is alive and in heaven because the Bible tells us so. How do you help your small children understand Easter? In a recent survey of over 500 kindergarten teachers around the country, two-thirds of the teachers stated that the children in their classroom were unprepared for kindergarten. Two-thirds of the teachers said that the majority of students do not know their ABCs. What can you do to prepare your child for kindergarten? Here are some suggestions from teachers. Actively participate in your child’s education with pre-reading and reading activities, such as reading books together and practicing the alphabet. Expose children to new experiences and talk with them about those experiences in order to improve their ability to speak and understand oral language and increase vocabulary. Practice identifying numbers and counting with both verbal and written activities. 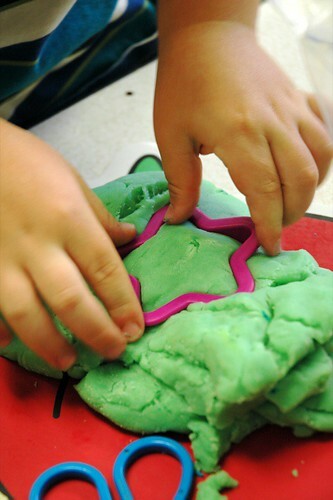 Work with children to identify shapes, colors, and objects in the world around them. Place children in social settings with other young children so that they can learn together while they also develop manners and the ability to share and be respectful. Age of Learning, Inc., which conducted the survey, has several online games to help your kids learn and be ready for kindergarten. Access is $7.95 per month. For free games, you might try SproutOnline.com, or learn Bible verses and ABCs at the same time with the ABC Scripture Series at Impress Your Kids. What do you think of this survey? Is it valid? 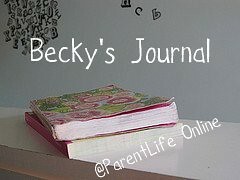 Here is the third in Becky Suggs’ series on her first pregnancy. Enjoy! You can read the first and second installments if you missed them. My husband and I visited our first baby superstore last week. We are pregnant with our first child. Not having done much research on baby things, we were really just going to get the lay of the land – to figure out what we were going to need and get a ballpark figure of what it was going to cost. While I consider both of us fairly educated people (we both have graduate degrees), as we walked down aisle after aisle, we realized just how much we have to learn. We looked at cribs and gliders, strollers and high chairs. We then moved on to bouncy seats and swings, changing tables and car seats. So many frills and fancy gadgets. Where was the basic car seat I sat in when I was little? Each aisle brought more questions and more realization that we have no idea what we are getting ourselves into! 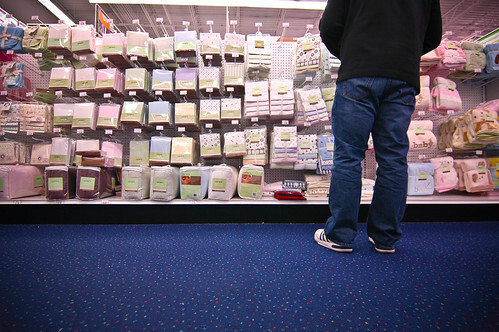 By the time we left the store, my mind had shifted to the thousands of choices we would have to make. How do we decide between the swing that vibrates or the swing that rocks? What about the stroller? I don’t jog, but do I need a jogging stroller in case I start? How will we know what brand of diaper to use? What method will we use to potty train? Where will my child go to preschool … much less, college? On the drive home, I laughed to myself. Yes, we’ve got a lot of choices to make. Yes, there are a lot of unknowns. But, I think it’s okay if we just start with the small stuff – like picking out a crib this week and maybe researching strollers next week. We have a lot to learn, but this is going to be a great adventure for all three of us! Do you have any suggestions for Becky? What’s your no-fail product that you love to tell others about? Becky Suggs and her husband, Robert, live in the mountains of Glorieta, New Mexico, with their pug, Sadie. They are expecting their first child in April. In her spare time, you can find Becky reading, enjoying the great outdoors, filling in squares to the latest crossword puzzle, and spending time with family. She has a passion for both kids and camping ministries. Superstore picture used with permission of Flickr Creative Commons. Click on photo for source. Here are a few extras from our Growth Spurts: 1 to 2 Years section. Fascinate your baby with bubbles and you will both enjoy playtime! Blow bubbles as you are waiting for Daddy to get home, at the bus stop, in the car pool line, or at the doctor’s office. 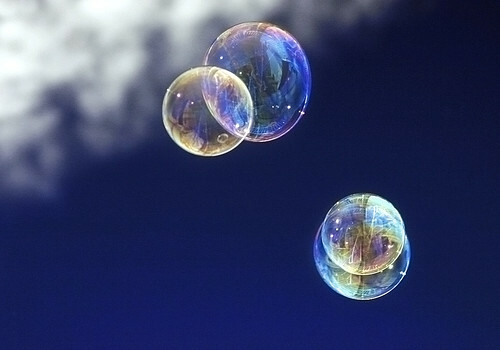 Blow bubbles at the park and watch where they drift away. Blow bubbles in the bathtub to make the bath water sudsy. Blow bubbles so your baby can work on fine motor skills, such as holding the wand. Blow bubbles and pop them as fast as you can. Blow bubbles as you dance to music. Your little one wants to explore her world. As her motor skills develop, she will be interested in stacking, pushing, pulling, and knocking things down! She will want to imitate Mommy in the kitchen and Daddy at the tool bench. Let your child explore unstructured play with the following age-appropriate toys. Do you have a favorite toy or activity for your 1- to 2-year old? My daughter has loved the Leapfrog Learn & Groove Table since she turned a year old. At 3, she’s growing out of it but my son is about to turn 1! Truth in the Tinsel is the kind of resource we love to share in ParentLife: a 24-day Advent experience for preschoolers and young elementary-aged kids. Each day has a Scripture, a craft, questions, and an optional activity that relates to the "lesson." To read more about it, visit Jessie’s blog. You can find tons of free Scripture-based activities to do with your young children at Impress Your Kids, too!